47 Gypsies opened in 2014 as a gift shop and gradually made the transition to a backpackers during winter 2016. We wanted to share this beautiful old holiday home with visitors not just during the day. So we started the transition to what you will see now when you book in at 47 Gypsies Backpackers. A place like your mama’s home, a little bit old and creeky but the vibe is relaxed and happy. 47 Gypsies Backpackers is a unique, gorgeous, original OLD Gordons Bay holiday home situated in just the best location, right across the road from the beach! There are fabulous views of False Bay with Table Mountain clearly visible across the Bay. Flanked on either side by interesting little restaurants, pubs, coffee and curio shops. The team is warm and welcoming. We are constantly upgrading and decorating, adding new features. We are not pretentious and want everybody to have a good time, rest and feel revived for your next adventure. for the next day. We accommodate backpackers, couples, solo adventurers, business travellers, dream seekers and anyone else who enjoys this soulful kind of experience. The house “talks to you the moment you set foot through the ancient front door”! You can spend your days on the lawn overlooking the ocean, walk to the old harbour for lunch. Rent a Kayak or SUP (Standup paddle board) if you feel a little more active. There is a common room with fireplace where you can spend your evenings if it is too cold to sit outside. The house has a big veranda leading to the lawn, overlooking the mountains and ocean. There is NO television in the house but there are plenty books and magazines to read. Basic cooking facilities available to guests. The common kitchen has 2 fridges to keep your food and drink cold. The village has many restaurants to choose from all walking distance from the backpackers. Visit our travel desk where you can book all your adventure tours. Cape Adventure Zone and Horseriding Cape Town. Want to go hiking then Adventureseekers is your go to company for all your guided mountain hikes. 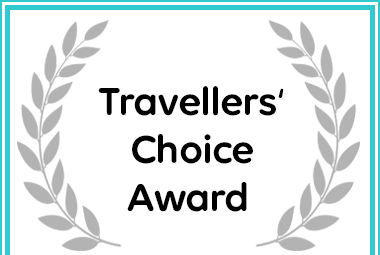 Afristay awarded 47 Gypsies in Gordon's Bay a Travellers' Choice Award.